Samsung is making good on its promise to bring more Disney characters to the Galaxy S9’s AR Emoji feature by adding Donald Duck as an emoji option. An update to the AR Emoji camera mode is available from the Galaxy Apps store on the Galaxy S9, and once you install it, you will be able to make Donald Duck copy your facial expressions and also turn your voice into the gibberish that’s a hallmark of the world’s most beloved duck. Donald Duck is the third character to be added to AR Emoji, following Mickey Mouse and Minnie Mouse. Samsung will also be bringing characters from newer Disney properties, such as The Incredibles (a sequel to which will be launching later this year) and Frozen, over the course of the year. If you haven’t yet tried out the Disney AR Emoji on your Galaxy S9, we have a nice little guide that can get you started quickly. 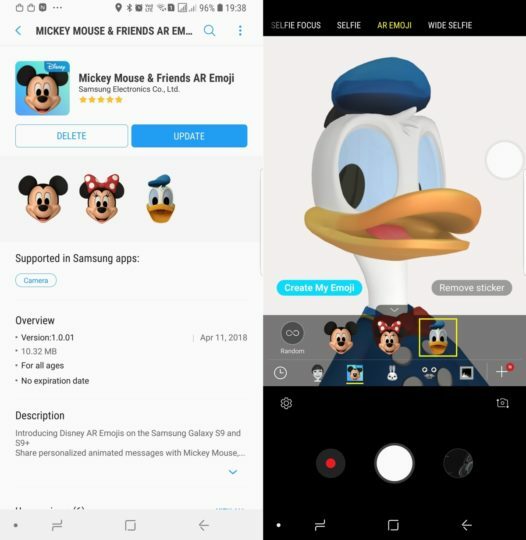 If you already have Mickey and Minni Mouse emojis installed, you can add Donald Duck to the mix by downloading the AR Emoji update from the Galaxy Apps app on your Galaxy S9 or S9+. You can also update through the Camera app. Open the app, switch to the AR Emoji shooting mode, tap the ‘+’ button at the bottom right, then tap the Mickey Mouse thumbnail, which will take you directly to the AR Emoji app listing on Galaxy Apps. Download the update, then go back to the camera to start using the Donald Duck emoji. And, while you’re at it, don’t forget to tell us what you think about the newest Disney emoji once you’ve had a bit of fun. You have got to be kidding! Are you guys asleep over there? My wife has been using this AR emoji for more than two weeks now! Lol. It was on other tech sites which is how she found out about it.. Might have been pocketnow or Samsung Central, she doesn’t remember which. I thought you guys were supposed to have your finger on the Samsung pulse! Are you sure other sites covered it? Not seeing anything on Google. Also, none of us here at SamMobile actually use AR Emoji so it was easy to miss the update, especially since Galaxy Apps isn’t very quick at notifying about available updates. Our team member who looks at these updates regularly wasn’t available the last couple of weeks, so that’s another reason we might have missed this. Definitely they did, it’s how my wife found it. It might not have been either of those, she doesn’t remember which one, but it was definitely on a few Samsung G+ community pages as I saw a post of one of the members demonstrating it about 2 weeks ago and I think my wife seen it even before then.. I searched for the G+ post, and I found it. Wanted to make sure I wasn’t imaging it. Lol. I’ll post it separately now. Sure, then a user found out about it, it didn’t get covered by actual sites. Also, we think the emoji might also have taken time to go live everywhere, so wasn’t immediately noticed. Mickey and Minnie Mouse emojis took a couple of days as well before going live for all. Why aren’t you posting the link to the proof that this Donald Duck character was reported on a few weeks ago??? Show some honesty. Is this really notticeable?… i cant find “the point”…sorry. We can’t see everything. It always easy to criticize, you could have rather send us a tip that it was available. How did you guys at Sammobile see the Mickey and Minnie Mouse AR Emoji but not see the Donald Duck emoji? Then do not critisise us…. I never ignore tips. Hey guys at sammobile, I know this is not related to the article, but, ever since j got android 8 on my s8, my battery life has become at least 20% worse, it’s not just me, my dads note 8, 4 of my friends with s8, they all got the same problem, I’ve read about this on a lot of forums as well, I don’t know how to report this to Samsung, but you guys have probably connections over there or at least know someone, can you please report this situation? Have you tried factory reset? I have oreo on my s8+ and is much faster and the battery is just awesome. Yesterday got 7,5h of screen on time with 27h since unplugged. I can’t ask for more. Clean application cache and reboot, then clear memory cache, reboot again and it will be solved. (My Note8 is working very good again, and battery life is better than in Nougat! Nothing will be lost, the app configuration will be clean ( probably you will have to re-enter or confirm your user and password in some apps, but just that.